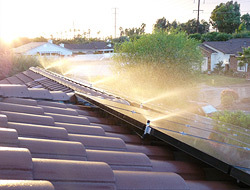 Can your cleaning systems be attached to home solar panels? If your home solar panels aren’t as clean as they should be, our solar panel cleaning systems are for you. 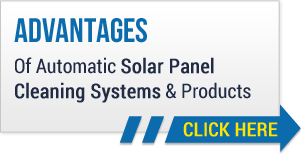 Our systems can be attached to panels from leading manufacturers such as Sharp, Kyocera, SunPower, Mitsubishi, Shott and more. Solar panels for homes or businesses increase their output when they are cleaned regularly. Our systems are professionally installed and are easy to use. We also offer Unirac security fasteners and other anti-theft devices to keep your cleaning system safe. We hope you’ll take the time to learn more about our product line and the many great benefits our products can offer you. Allow your solar panels to perform at an optimum level simply by making sure they are as clean as can be. Take a moment to honestly assess if your solar panels are being cleaned as often and as well as they should be. If the answer is no, Heliotex can help. The bottom line is that a cleaning system can increase output from your solar panels anywhere from 5 to 30%. That is a very significant number, and one to keep in mind as you consider whether to invest in a cleaning system of your own. We make the purchasing and installation process easy for our customers. In no time at all you’ll be reaping the benefits of a cleaning system that promotes maximum output from your solar panels. Going solar at your home is a decision that offers many benefits, and you deserve to reap every one of those benefits. The best way to do so is by regular solar panel cleaning, and our systems allow you to clean as often as you’d like.